Solar power was once so costly it only made economic sense on a spaceship. As costs went down, volumes went up, driving costs further down, which drove volume further up, which drove costs further down… and so on. The spaceship has come down and has now landed on Earth — no wonder that this new reality seems alien to many. Close to earth, wind power is even larger than solar and follows a similar virtuous cyclone, albeit at a more moderate pace, and the latest purchase agreements show that it is still the cost leader (but barely). 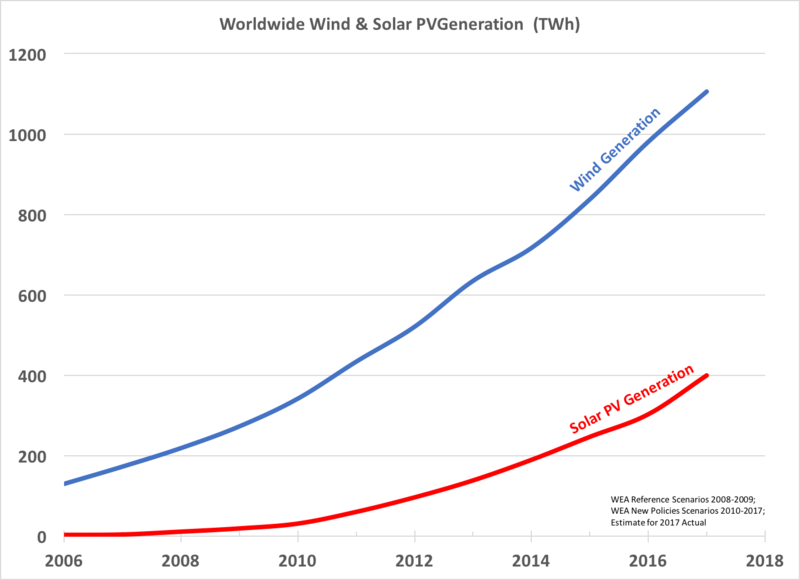 Worldwide photovoltaic solar generation (in terawatt-hours) has increased tenfold since 2010, following an exponential growth curve (see the figure). Wind increased even more in absolute numbers, almost quadrupling since 2010. Solar and wind power are relatively small but already competitive with traditional generation, which will continue to fuel the virtuous cycle of higher volumes and lower costs for years to come, crowding traditional generation out of the market. We haven’t yet seen the end of this story. [i] International Energy Agency, World energy Outlook 2017, New Policies Scenario, p.650. This entry was posted in Solar Energy, Wind Energy on January 13, 2018 by Benoit Marcoux.